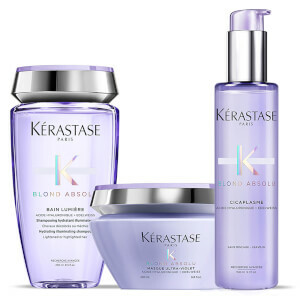 Restore colour vibrancy of blonde locks with Kérastase Blond Absolu Ultra Violet Shampoo, Treatment and Masque Trio; a three-piece set of haircare treats formulated specially for blonde tresses. Designed to fend off unwanted brassiness for icy cool blonde locks, the trio work in synergy to cleanse, treat, nourish and fortify for silky-smooth hair that shines bright. A deeply nourishing hair cleanser that boosts luminosity. The purple shampoo works to deliver lasting protection against brassy and yellow tones, whilst defending against pollution and other external aggressors to maintain a healthy, natural-looking shine. Hyaluronic Acid and Edelweiss Flower work in harmony to melt away dirt and excess oil and replenish hydration, leading to a silky-soft and vibrant head of hair. 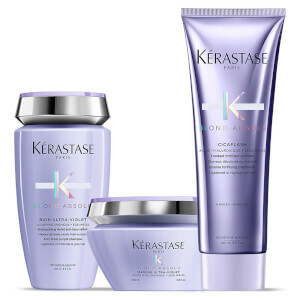 An intensive, leave-in hair mask that brightens blonde, highlighted and grey hair. The shimmering, lavender-coloured cream coats each strand in a nourishing veil to smooth the hair cuticle and seal split ends in order to tame frizz and flyaways. Enriched with Hyaluronic Acid and Edelweiss Flower to deliver intense hydration, the rich treatment protects hair from temperatures up to 230°C while defending against damaging UV rays and pollution. After use, locks feel sleek and supple and are infused with a brilliant shine. 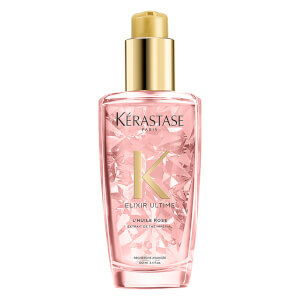 Shampoo: molhe bem o cabelo. Retire o excesso de água antes de aplicar uma quantidade do tamanho de uma moeda de 20 cêntimos de shampoo e aplique toque a toque em 5 zonas fundamentais do cabelo. Junte água e emulsione. Deixe atuar durante 2 a 5 minutos. Enxague abundantemente. Recomendamos que alterne com o Bain Lumière semanalmente ou como segundo shampoo, para uma limpeza mais profunda e hidratante. Máscara: aplique no cabelo lavado e enxuto com a toalha. Massaje no comprimento e nas pontas. Deixe atuar durante 5 minutos, para uma neutralização leve, ou mais tempo (até 10 minutos), para uma neutralização mais forte. Junte água, emulsione e enxague abundantemente. Tratamento Sem Enxaguar: no cabelo seco com uma toalha: use 2 a 4 doses, dependendo do comprimento e da espessura do cabelo. Espalhe até às pontas e penteie para distribuir uniformemente o produto. Seque com o secador ou deixe secar ao natural. Em cabelo seco: aplique no cabelo depois de secar com o secador ou secar ao natural, como um toque finalizador para controlar o frisado e reforçar o brilho. Penteie ao seu gosto. 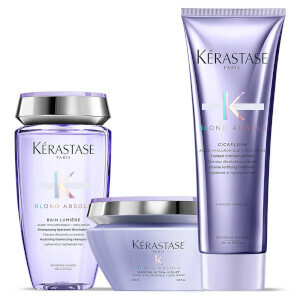 Shampoo: Aqua / Water, Sodium Laureth Sulfate, Coco-Betaine, Sodium Chloride, Glycol Distearate, Cocamide Mipa, Dimethicone, Citric Acid, Sodium Benzoate, Sodium Hydroxide, Hexylene Glycol, Ci 60730 / Acid Violet 43, Salicylic Acid, Carbomer, Limonene, Guar Hydroxypropyltrimonium Chloride, Hydroxypropyltrimonium Hydrolyzed Wheat Protein, Magnesium Acetate, Glycerin, Sodium Hyaluronate, Tocopherol, Aspartic Acid, Glycine, Arginine, Glutamic Acid, Phenoxyethanol, Leontopodium Alpinum Flower/Leaf Extract, Fumaric Acid, Malva Sylvestris Flower Extract / Mallow Flower Extract, Potassium Sorbate, Parfum / Fragrance. C224442/1. Masque: Aqua / Water, Cetearyl Alcohol, Paraffinum Liquidum / Mineral Oil, Dipalmitoylethyl Hydroxyethylmonium Methosulfate, Cetyl Esters, Cetrimonium Chloride, Citric Acid, Sodium Benzoate, Sodium Hydroxide, Caprylyl Glycol, Salicylic Acid, Ci 60730 / Acid Violet 43, Limonene, Glycerin, Sodium Hyaluronate, Tocopherol, Ci 45100 / Acid Red 52, Leontopodium Alpinum Flower/Leaf Extract, Malva Sylvestris Flower Extract / Mallow Flower Extract, Potassium Sorbate, Parfum / Fragrance. C224934/1. Leave-in Treatment: Aqua / Water, Cetyl Alcohol, Cetearyl Alcohol, Cetyl Esters, Amodimethicone, Behentrimonium Methosulfate, Phenoxyethanol, Quaternium-33, Tocopherol, Behentrimonium Chloride, Trideceth-6, Limonene, Isopropyl Alcohol, Cetrimonium Chloride, Glycerin, Citric Acid, Sodium Hyaluronate, Serine, Ethylhexyl Salicylate, Linalool, Sodium Hydroxide, Ci 60730 / Ext. Violet 2, Citronellol, Leontopodium Alpinum Flower/Leaf Extract, Malva Sylvestris Flower Extract / Mallow Flower Extract, Sodium Benzoate, Potassium Sorbate, Parfum / Fragrance. C224394/1.